ps if you enjoy this, please link. I'll be updating through the movie at least. Subsequent updates are already written and will be posted 1-2 times a day. It goes without saying that there will be massive spoilers. DeTecT SaPPHiST SenTiMenTS. STRanGeLY aROUSinG. Do you think there is a correlation between Rorschach fangirls and Heathcliff fangirls? I'm not sure! I mean, at least Heathcliff was hot. Rorschach is just creepy. She makes such a big deal about how un-hot Heathcliff is that you know he is totally smoking. (Plus, he is Ralph Fiennes. Although he ruined a little of Ralph Fiennes for me...) I think they have similar thought processes though. I was thinking "Plus, he is Laurence Olivier," but same difference. See, I always read that as the English people thinking he's horrible looking because he's exotic-- but he's like, obviously Mediterranean and hot. I don't know about the thought processes being the same. Heathcliff is pretty sane but horrible and stuck on vengeance. Rorschach is pretty insane and grotesque but pretty much on the ball and out for truth. It IS a plan by Veidt! I know it! Veidt and the Squid Growers of America! The union is going to be -pissed-. KeeP SeeinG aCROnYM: OMG. CODe? CeRTainLY. BUT FOR WHaT? OrDeR OF MaSOniC GODS? OneROUS MaLFUnCTiOn GeneRatOR? 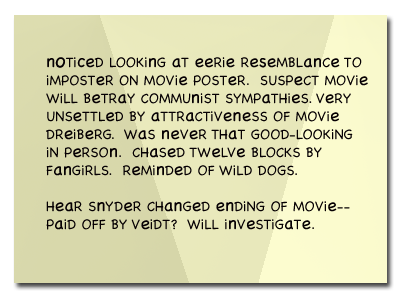 Totally Veidt's conspiracy. Also, Dreiberg definitely not that attractive. CaSTinG DiReCTOR MOST LiKeLY HOMOSeXUaL. There will be more! I plan to keep it up at least through the movie. Huzzah! I'm one for the nerds, so I was always a fan of Dan Dreiberg -- but I never pictured him being quite as hunky as Patrick Wilson.